When bookworms stumble across a word we don't know, we face the classic dilemma of whether to put the book down to look up the word or forge ahead in ignorance to avoid interrupting the reading experience. 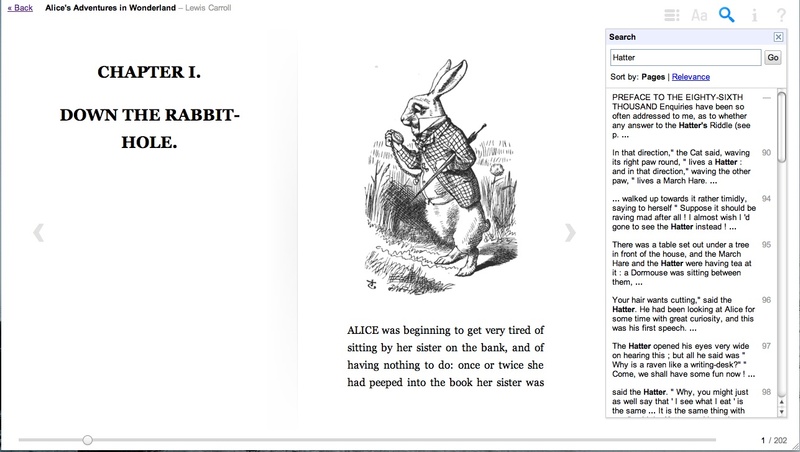 Well, fret no more, readers, because today you can select words in Google eBooks and look up their definitions, translate them or search for them elsewhere in the book from within the Google eBooks Web Reader—without losing your page or even looking away. 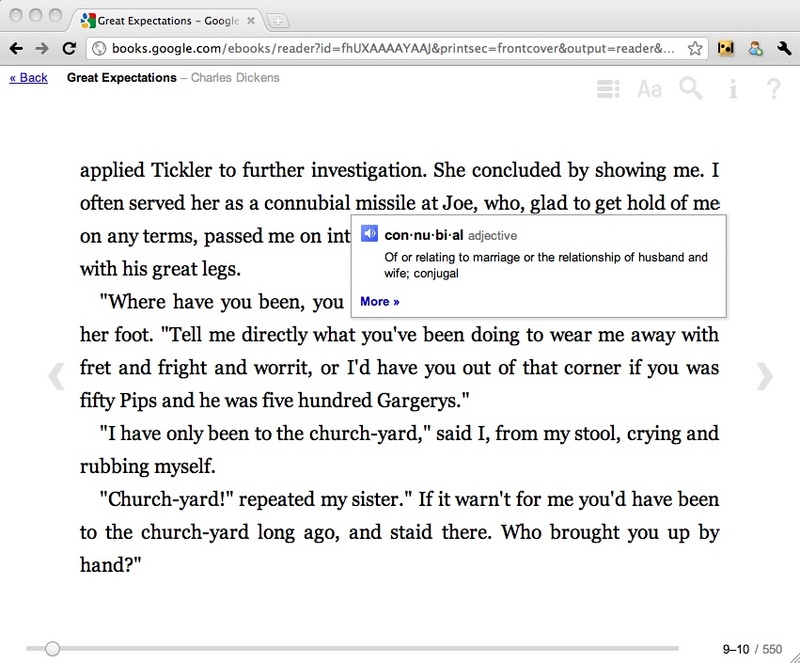 Click “Define” and the pop-up now displays a definition of the word via Google Dictionary, without leaving the page you’re on in the Google eBook. Click on the audio icon to the left of the word you want defined to hear the definition pronounced aloud. If you decide you do want to leave the page, select “More” to go to the Google Dictionary page for the word, which provides additional information like usage examples and web definitions. You can also translate a single word or several sentences of content into dozens of languages, from Afrikaans to Yiddish, by selecting the "Translate" option. As with definitions, you'll see the translated text displayed in the pop-up window. 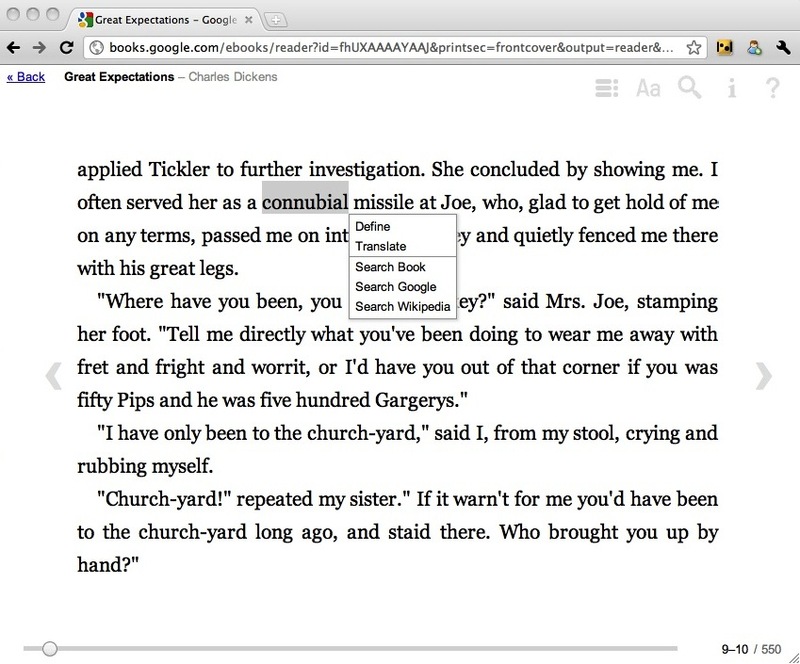 By selecting one of the search options, you can search for the selected text in other places within the ebook itself or across the entire web. 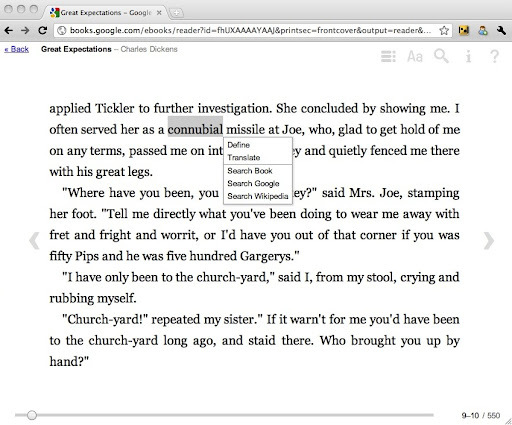 “Search Book” brings up all the instances in which the selected text appears in the ebook. You can also access the search options by clicking on the magnifying glass icon in the upper right-hand corner of the Web Reader. Click on a search result to jump to that section. “Search Google” and “Search Wikipedia” open up a new browser tab displaying the search results for that text on Google and Wikipedia, respectively. 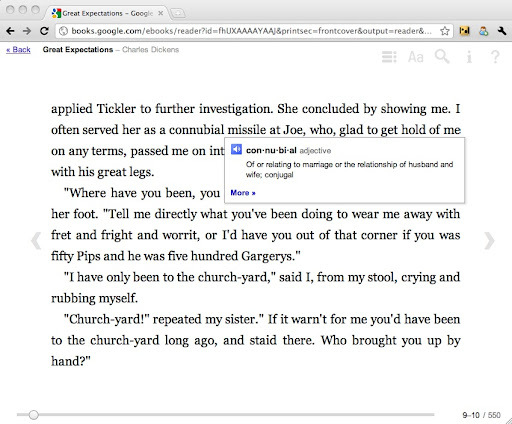 Go ahead and give these new features a spin by reading a Google eBook. Update 5:54pm: Included details about "Flowing text" vs. "Scanned pages."